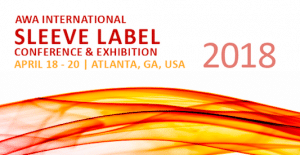 Every year, there are numerous flexible packaging industry events hosted all over the world. As a leader in integrated machinery solutions, here at Karlville, we are always excited to exhibit and attend these conferences and trade shows because there are not only great opportunities to meet prospective customers but also to stay up to date with new market trends and technologies. We want to share with you, our top 5 pick for 2018. Make sure you get updates on these shows and take advantage of their early bird registrations. You can also subscribe to our newsletter to receive free passes for some of the shows we exhibit at. Check out our events page to see which ones we will be attending and be sure to stop by our booth and say hi! What: The AWA International Sleeve Sabel Conference & Exhibition is in its 12th year, and is the only dedicated conference addressing this brand enhancing and fast growing method of labeling and product decoration.The conference brings together experts in their respective disciplines and addresses key issues and opportunities for the industry across the value chain and across the globe. What: The Global Pouch Forum, celebrating the 21st edition, returns to Miami in June, bigger and better than ever. Known for its strong educational agenda, excellent networking opportunities and extensive flexible packaging exhibition space, the forum attracts a loyal and growing attendance each year, drawing more than 600 attendees in 2016. What: ProPak Asia is the No. 1 and largest industry event of its kind in Asia. It’s Asia’s best platform to connect to the regions rapidly expanding processing and packaging industries. Going from strength to strength every year, ProPak Asia has a proven track record over 25 years of delivering the highest quality and quantity trade buyers, the greatest number and selection of international suppliers, and the best showcase of latest technology and innovations. What: The previous edition attracted 17,407 attendees from 88 countries, who came to see over 450 exhibitors occupy more than 201,000sqft of space. Karlville will be presenting our solutions, what we do best,Shrink Sleeve, Flexible Packaging, Pouch and Handle and Tape Multipacks. If you are part of this event, please come by, we would like to welcome you and support your business. Where: McCormick Place, Chicago, Illinois, USA. What: In 2018, PACK EXPO International will be the world’s largest packaging trade show. Co-located with Healthcare Packaging EXPO the event features a marketplace of 2,500+ exhibitors displaying processing and packaging equipment and technologies for virtually every vertical market, drawing 50,000 attendees from across 40+ vertical industries and offering free educational presentations in several venues on the show floor.